What do you do when the electricity goes out? Now, you can Plug In, and Power Up! 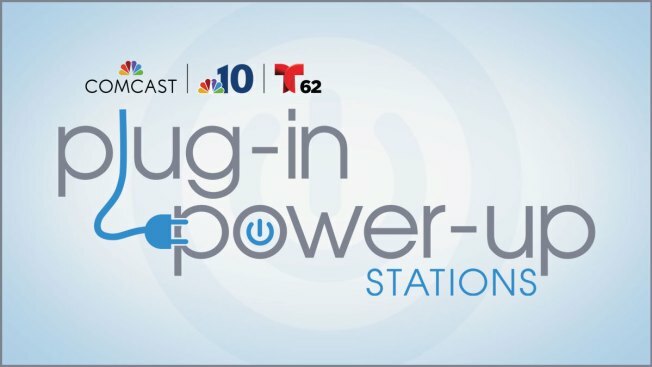 NBC10 and Telemundo62 are partnering with Comcast to offer viewers who lose power the ability to recharge their devices at Xfinity store locations throughout the region. As power outages occur, listed locations will serve as Plug In, Power Up sites to assist viewers in need. Anyone is welcome to take advantage of this FREE service. Download the NBC10 app for latest weather conditions, and check this page frequently for updates. Store Hours: Monday – Saturday, 9 a.m. – 8 p.m.; Sunday, 11 a.m. – 5 p.m.
Store Hours: Monday — Saturday, 9 a.m. — 8 p.m.; Sunday, 11 a.m. — 5 p.m.
Store Hours: Monday – Saturday, 9a.m. – 8 p.m.; Sunday, 10 a.m. – 6 p.m.
Store Hours: Monday — Saturday, 9 a.m. — 8 p.m.; Sunday, 11 a.m. — 6 p.m.
Store Hours: Monday – Saturday, 9 a.m. – 9 p.m.; Sunday, 10 a.m. – 6 p.m.
Due to severe weather, participating locations are subject to change.